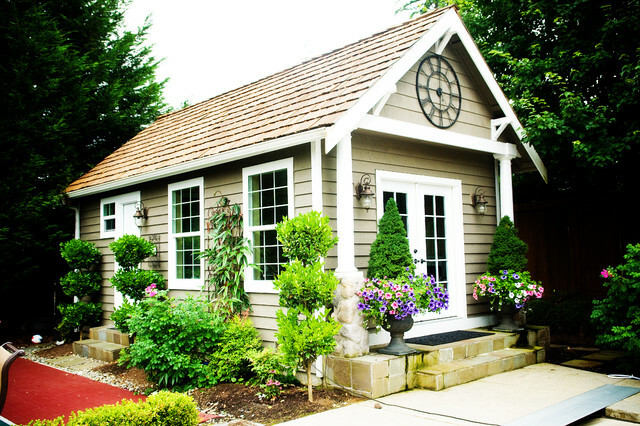 Outdoor Living - Craftsman - Shed - Seattle - by McCarthy Custom Homes LLC. What are the flowering plants in the pots on the front porch? Lanterns - Where did you purchase the lanterns? Thanks!! Have you tried Lantern & Scroll ( find them on here or Facebook). I've seen similar lanterns there, they can help you! What color is the paint on the siding and trim? Love this! Nice clock. Where did you get it? I purchased a similar clock at Hobby Lobby. Lovely! What are the dimensions of this structure? What are the front evergreens? SO CUTE! What are the steps made of? What are the three topiary type trees/bushes? What is the square footage of the building? Thank you very much. Garage - What is the exterior color called?